I love The Healthy Chef, Teresa Cutter. It's been over 6 years since I've been making her healthy recipes and adjusting some ingredients depending on my pantry staples. Today's recipe is no different. I'm making these babies this week (as they take a little time to prep the day before) and I'll be substituting the dairy milk for soy, egg wash with simply milk and coconut oil, honey with maple syrup and replace the eggs with chia or linseed eggs. Easy right? If you want to keep it traditional, see Teresa's original recipe below and enjoy! COMBINE the flours, yeast, honey, milk, eggs, orange zest, vanilla, sea salt, cinnamon and ginger into the bowl of your bench top mixer. MIX with a dough hook at low speed until combined, then increase the speed to medium and mix further for 8 minutes until smooth. ADD the olive oil slowly, a little at a time, until incorporated into the dough. MIX the raisins and apricots gently through the dough. TURN OFF your mixer and remove the bowl. PLACE the dough into the fridge overnight to rest and develop for a further 12 hours. This dough is quite sturdy, so if you go over 12 hours, that’s ok, so long as you cook the dough the following day. Resting also loosens up the dough so you end up with a light and fluffy hot cross bun. DIVIDE the dough into 24 even size portions. LEAVE to set in a warm place for about 2 hours. This depends on the warmth of your kitchen. I usually turn the oven on just to warm the kitchen to help them prove, and the dough should at least double in size. MAKE an egg wash by combining the egg and milk. BRUSH tops of the buns with the egg wash.
BAKE for 35 – 40 minutes or until baked through and golden. MELT chocolate then pipe over the buns before serving. + Notes and Inspiration Add 2 finely diced roasted apples, which combines wonderfully with the raisins. Teresa, you're brilliant. 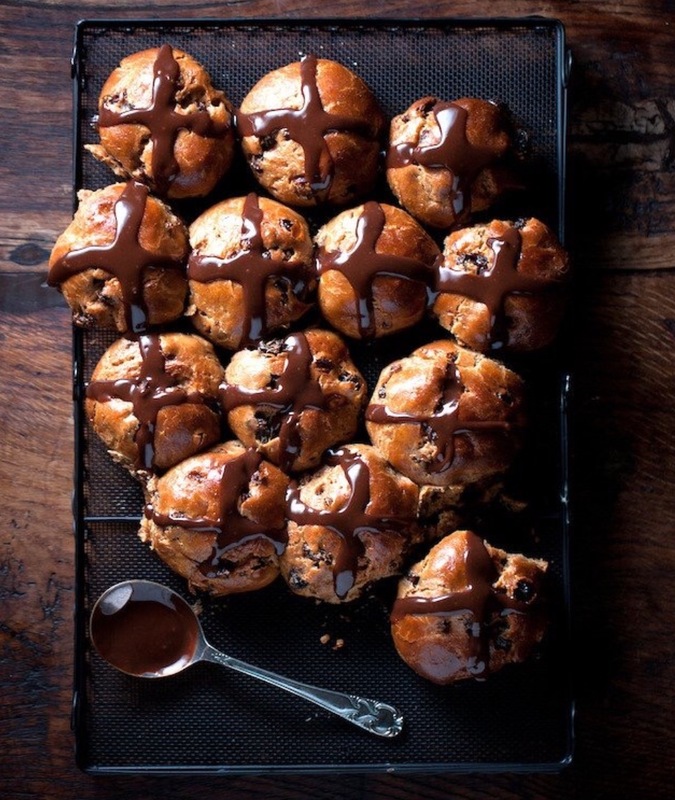 Thanks again for creating this amazing healthy hot cross buns recipe, I can't wait to make it! And remember! Chocolate is a powerful source of antioxidants so choose dark chocolate wherever possible because eating chocolate is like eating a salad (smile wink). That makes it a plant!